Location: On the southern Black Sea coast, near the town of Bourgas, and about 30 km from Bourgas Airport. There is plenty for all the family to enjoy - great sports and excursions to sample, a rich choice of excellent restaurants, discos and nightclubs. Want to try your luck at the resort casino? Wherever you go you will find that the prices are excellent compared to the UK. 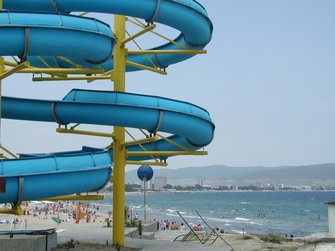 Sunny Beach has many shops, stalls and amusements selling all kinds of novelties. Shopping for souvenirs is great fun. It's the place for kids too - playgrounds, slides, games, swings, pools and a Kiddie Club - with the whole resort being complemented by our team of hotel representatives, Kiddie Club rep and our resort activity organizer. For a chance to get away from the hustle and bustle of the largest Bulgarian resort and enjoy the tranquillity of days gone by visit the nearby fishing village of Nessebur (the bus ride takes about 15 minutes and costs less than 20 pence). So go ahead and take advantage of everything that Sunny Beach has to offer - long sunny days, great food, top-rate nightlife, sports and a choice of leisure activities.